This demonstration was the biggest one ever held in the lower Ebro region – much bigger than the 25,000-people rally in Móra de l’Ebre in 2001. 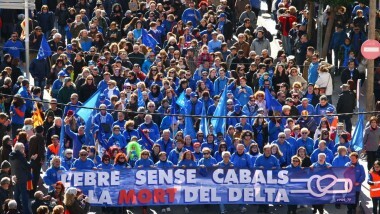 The last demonstration organized by the Plataforma en Defensa de l’Ebre (PDE) in March 2014 brought 15,000 onto the streets of Sant Jaume and Deltebre. The farmers’ union, Unió de Pagesos supported the demonstration – despite some farmers from Lleida being in favour of the Plan – and two tractors led the protest through Amposta. 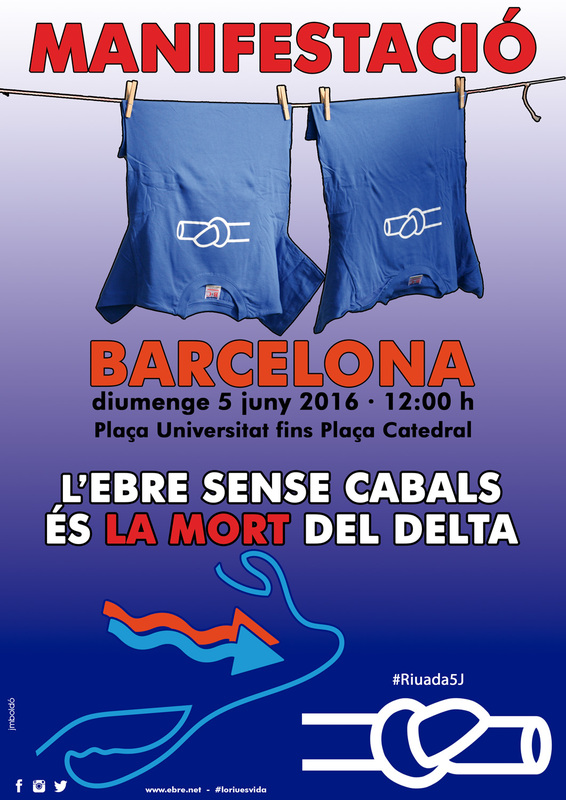 Most demonstrators wore the well-known blue t-shirts with the logo of the knotted water pipe. The event also attracted the explicit support of Catalan groups Òmnium Cultural and Assemblea Nacional Catalana, leading to a notable presence of pro-Catalan independence flags and symbols too. Fifteen years after the protests against Aznar’s Spanish Hydrological Plan, slogans like “Water for the river, life for the Delta” or “The river is life, no to water transfers” were heard once more. The PDE explained that this time the direct threat of the new Plan is not a water transfer, yet, but a huge increase in predicted and reserved irrigation lands upriver which would lead the lower Ebro with a flow of only 3,000 cubic hectometres at the river mouth. This figure is utterly insufficient to conserve the Ebro Delta, already suffering from regression and subsidence. University professor Amparo Moreno read the manifesto, explaining that this 50% increase in irrigated land would make it impossible to save the Ebro Delta. “This is not just an environmental problem, but a social and economic one,” Moreno explained. “Hard times are coming for these lands but, if we are strong, we have a good chance of stopping this threat to the river and Delta, the new basin Plan,” stated the PDE spokesperson Manolo Tomàs. All the Catalan political parties, except the PP and Cs, supported the demonstration with many high-ranking members present. The PDE also thanked the participation of citizens from all around Catalonia as well as from Aragon. The PDE insisted this social movement must continue to demand that European institutions intervene directly in the Plan and stop it. “We are convinced that Europe cannot allow this Plan to go ahead, and each one of the thousands of of people here today is a reason for this,” said Joan Antoni Panisello, another sopkesperson of the PDE. “This demonstration is our ‘business presentation card’ calling for Europe’s intervention,” explained Tomàs. Apart from members and representatives of numerous organizations and political bodies, the President of the Catalan Parliament, Carme Forcadell, was also present. The Catalan government’s vice-president and Economy Minister, Oriol Junqueras, and Justice Minister Carles Mundó, and Territory and Sustainabilty Minister Josep Rull also came. Rull stated, “We are here to show our rebuttal of the Ebro basin plan,” explaining that this plan is bad for the Delta as it does not guarantee environmental flows, and bad for irrigation as it does not aim to modernize existing systems. The MEP Ernest Urtasun was also at the demonstration and will be present in the visit of MEPs to the Delta on 8 February. Urtasun stated that the Plan “does not comply with European legislation” such as the Water Framework Directive or Birds and Habitats Directives. “We call on the European Commission to stop this Plan,” stated Urtasun. 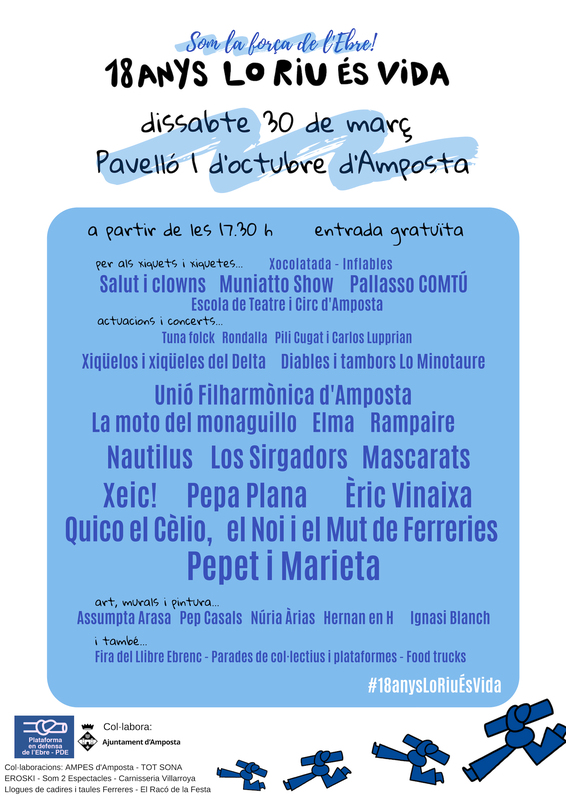 Quick translation of http://www.ara.cat/societat/LEbre-Delta-arrenca-manifestacio-dAmposta_0_1518448331.html .